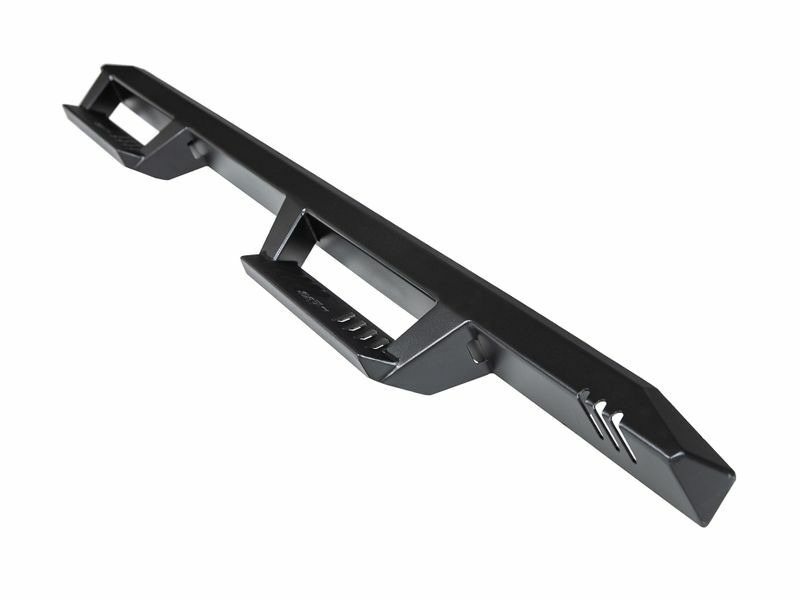 The N-Fab Epyx Step System is finally here and ready to transform your truck to an all new level. This superior design provides a large stepping area at every door, creating a safe stepping surface for kids and adults alike. By taking the popular hoop step design and putting a modern twist on it, the N-Fab Epyx Steps look great with modern vehicles' sharp lines and angles. Currently available in a cab length configuration, these steps are constructed of steel with a textured black powder coat finish, making them perfect for any weather conditions you find yourself in. If your truck can get in those conditions, these steps can handle it. The N-Fab Black Epyx Steps feature a first generation modular bracket, allowing you to slide the hoop step until fitment is perfect. N-Fab gets it: every truck is different. While anyone can get measurements to make the nerf bar close to perfect, this modular bracket allows you to tweak the position of the bar until the step are exactly where you want them. In fact, the Epyx's hoop steps are a massive 15 inches wide by 4 inches deep, creating an easy, secure stepping surface for you and your passengers. The N-Fab Epyx Steps come with vehicle specific mounting brackets and hardware so installing a set of steps has never been easier. Brackets will line up with factory holes, so no drilling is required. Better yet, the easy-to-understand installation instructions are made specifically for your vehicle, so you'll be able to follow them and get those steps installed in no time. To finish it off, this step system comes with a limited lifetime warranty on the construction and workmanship of the product, so you can be confident that you are buying from a trusted manufacturer with years of experience in award-winning nerf bars. The textured black powder coat finish also carries a 5 year warranty, so you can use and abuse these nerf bars, and experience for yourself that N-Fab's products are better than the rest.